Hot springs (onsen: 温泉), or literally “warm spring”, are a common part of the average Japanese lifestyle. They’re used for relaxation, rejuvenation and fighting off sickness if you think you’re about to catch a cold. There are over 2500 hot springs in Japan, many of which are natural springs and others which are man made. Some tap into a natural spring but offer a more modern room style bath, while others have different chemical elements in them, such as chloride, carbon dioxide, sulfate and many more that have therapeutic effects on the body. 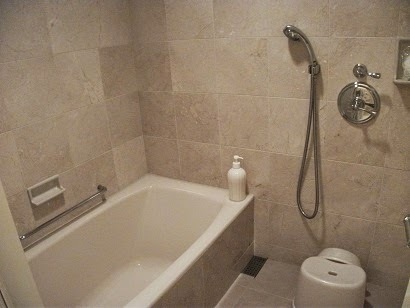 There are some rules to follow, such as before you enter the bath, you must first clean your entire body in either a shower or by sitting on a stool and rinsing with a bucket — this also applies to most Japanese households where when using the bathtub, there’s often a shower built next to the tub with a drain directly on the floor, so you can rinse off before entering the tub. You must also not dunk your head into the onsen, you can only be in the water from the neck down. This is one rule that most foreigners may not be aware of and probably break often. In Hakone at Yunessun Spa, there is a popular type, the coffee-bath, where you bathe in coffee mixed with hot spring water. It’s said to be good for the skin along with a boost of energy (it’s coffee after all). I know how I feel after drinking too many cups of coffee, so I personally would be hesitant to bathe in an entire vat of it! 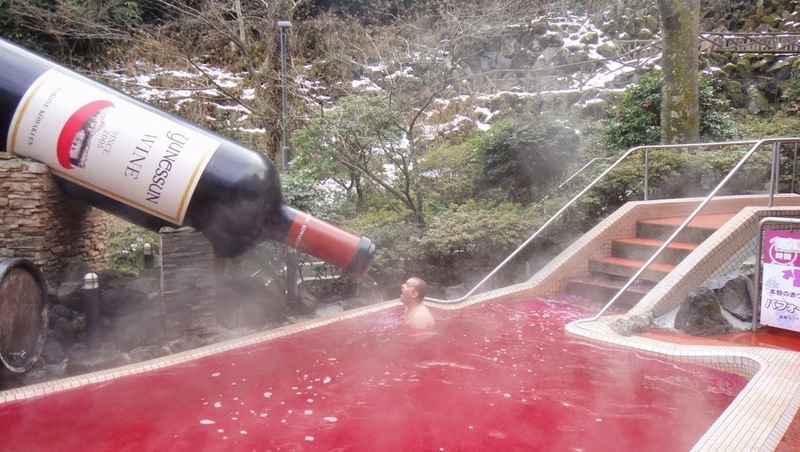 They also have red wine, green tea and sake onsen there. They really got creative with their onsen. Another type of more common spa treatment is the sulfur onsen (硫黄泉). These smell of rotten eggs, but are supposed to have amazing benefits for people with lung issues, along with expanding blood vessels. Because it can be toxic, sulfur onsen need proper ventilation. 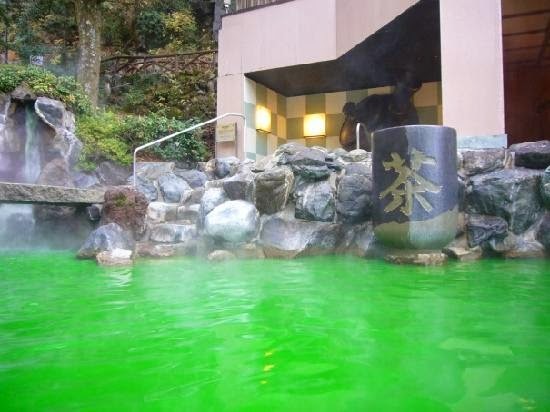 There are so many different types of onsen that help with common diseases and are overall good for your skin. There is the iron onsen (鉄泉) which replenishes the body of lost iron. There is sodium bicarbonate saline onsen (炭酸水素塩泉), which makes your skin very smooth. Salt onsen (塩温泉) helps the body retain body temperature, so you stay warmer for longer once you exit the bath. While there are many types that contain minerals, the most abundant in Japan do not contain enough of them to really do much to the body, therefore you can stay in them for longer periods of time without worrying about the effects it might have on your health. Depending on where you are outside of Japan you may be able to find Japanese style onsen, meaning you wouldn’t necessarily have to venture all the way to Japan to experience one, though a lot of tourists travel to visit all of the different types that are there.